Irma made Marco Island a symbol. Forty years ago, a battle over this beachfront community changed the way Florida builds. After Irma, could it happen again? 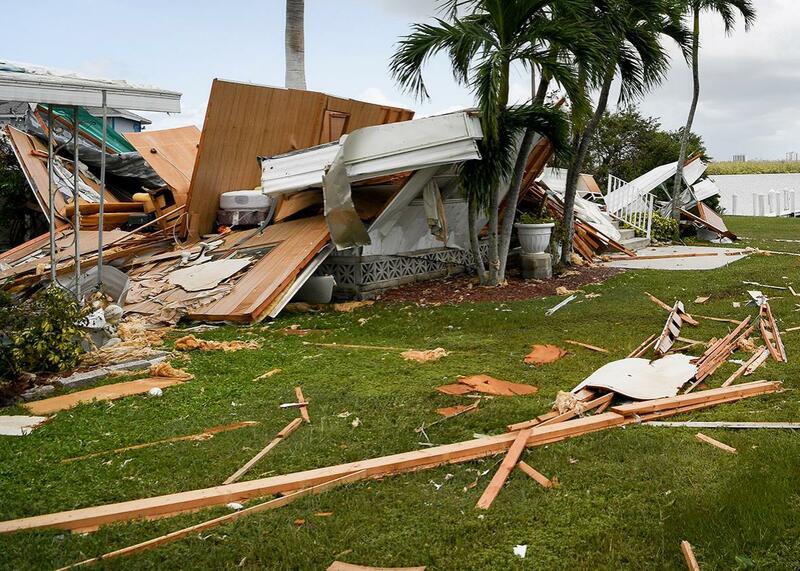 A mobile home, destroyed by Hurricane Irma, on Marco Island in Florida on Monday. Hurricane Irma arrived in Florida by tearing through the Keys, but it made its second landfall at Marco Island, a picture-perfect resort community with a five-mile white-sand beach just south of Naples. Each winter, Marco swells from about 17,000 people to more than 40,000 thanks to vacationers and southbound snowbirds. On Sunday morning, as the Gulf of Mexico rose around the island’s houses, Marco’s fate elicited far-flung cries of concern in the way that only a beloved beach town can. Now, residents return to survey the damage. There is no power. No water. The Dolphin Tiki Bar & Grill is in ruins. Virtually all of Marco Island is in the FEMA flood zone; it is also threaded through with 91 miles of canals that abut nearly every house like the wires of a circuit board. It is a perfect symbol of how yesterday’s South Florida ambition is today’s vulnerability. And it is the kind of community where, once it has dried out, planners will have to ask: How should this place—always susceptible to hurricane damage, newly exposed to rising seas—be rebuilt? Forty years ago, the consensus of the state and federal governments was that Marco Island should not have been built at all. The community was the setting for one of the biggest development controversies in the United States and nearly ruined one of Florida’s largest and most celebrated developers. In a region with a notorious building addiction, it became the site of the environmental movement’s greatest victory over the Florida growth machine. Ecological foresight halted millions of dollars in real estate development and all but ended an engineering technique that had turned the South Florida coast from swampland to resort. “This may be the last major development to take place in Florida,” Florida Sierra Club lobbyist David Gluckman said in 1982, when Deltona, the developer of Marco, turned over its remaining holdings to the state of Florida as a nature preserve. Of course, it wasn’t. Two thousand miles of levees and canals have transformed South Florida from a “barren, swampy, and good-for-nothing peninsula,” in the words of an American soldier who fought to conquer the place from the Seminole Indians in the 1830s, into a glittering mega-region of 8 million souls. It’s a real-life Joni Mitchell chorus where the joke, Dexter Filkins recalls, was that every new housing development was named for the ecosystem it vanquished. You better believe Marco Island has a Mangrove Court. Still, Marco Island is a reminder that we’ve changed the way we build before, and could again. When brothers Robert, Elliott, and Frank Mackle discovered Marco in the early 1960s, half of its 10 square miles consisted of mangrove swamps. Home to just a few hundred people and an abandoned clam factory, it was the single largest undeveloped barrier island property in South Florida. 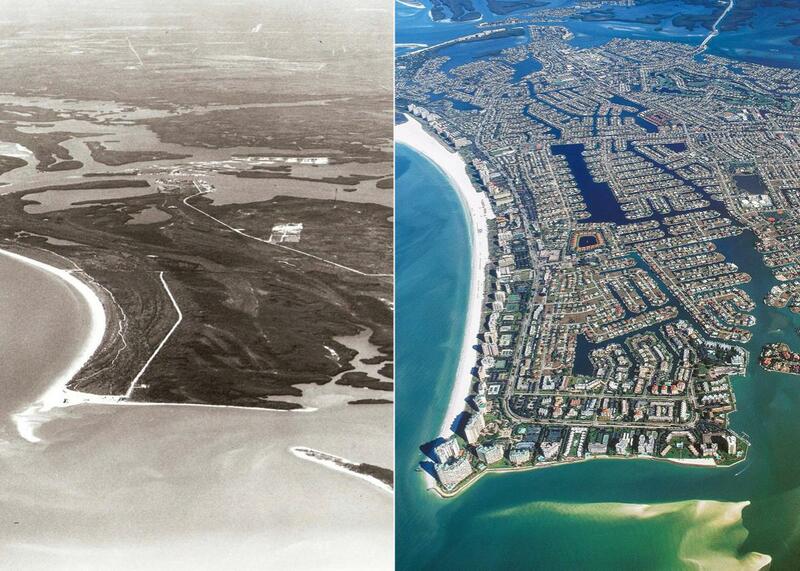 Marco Island in 1964 (left) and present day. The Mackles were among the most famous developers in South Florida, which is like saying someone is one of the best-known actors in Hollywood. Between General Development Corp. and Deltona, which they founded in 1962, the brothers were responsible for building 75,000 Floridians’ homes, including the communities of Port Charlotte, Port St. Lucie, Port Malabar, Deltona, Spring Hill, Citrus Springs, Marion Oaks, Sunny Hills, and Key Biscayne, where Richard Nixon later bought a home. But Marco was bolder still. The plan called for 35,000 residential units, which would require displacing 18.2 million cubic yards of ground (more than 150,000 dump trucks’ worth), dredging the land into channels, and using the dredge to create development sites in the swamp. This method is common across South Florida; Cape Coral, a little to the north, is a good example. 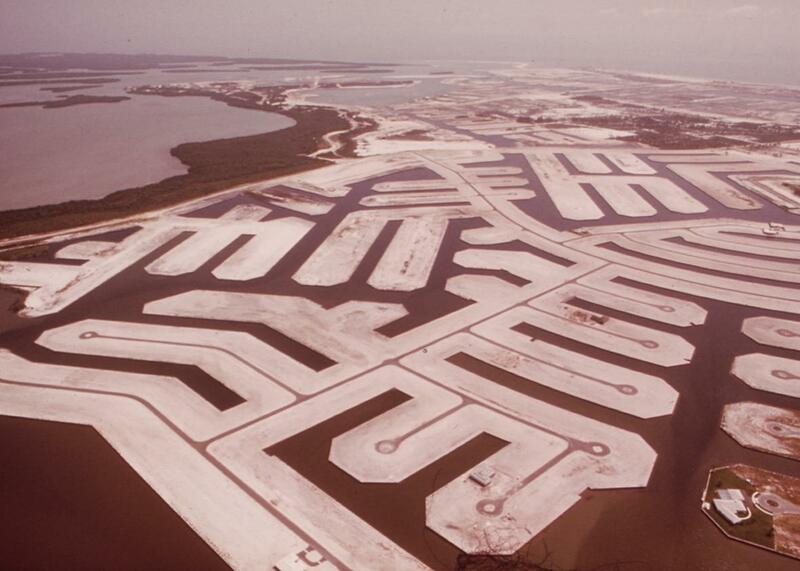 Still, at the time, Marco Island was the largest “finger-fill” waterfront housing project to ever come before the Army Corps of Engineers, Science reported in 1976. The environmental policy revolution of the late ’60s and early ’70s thwarted the Mackles’ plans. First, the Florida Legislature passed a law requiring biological impact studies for all dredge-and-fill projects. Second, the Army Corps agreed to consult with the secretary of the interior before approving permits for controversial projects. Third, the Army Corps denied a permit to fill in 11 acres of Boca Ciega Bay, near Tampa, to build a trailer park, in a closely watched case that was upheld in the 5th U.S. Circuit Court of Appeals. And finally, in 1975, the Army Corps published a rule that wetlands should not be sacrificed for uses that were not either water-dependent (i.e., a dock) or required by the public interest. The final phases of Marco Island—creating 4,000 lots on reclaimed land in Barfield Bay and Big Key—did not meet that standard, the corps ruled in 1975. Deltona sued, arguing the ruling constituted a taking of their property rights. After half a decade, its appeal was rejected by the Supreme Court, and the company ultimately agreed to a land trade with the state of Florida. It took years for the Mackles to settle with the buyers of lots that were never built, costing the developers an inflation-adjusted quarter billion dollars. They had to sell their beloved beachfront hotel to Marriott and ultimately stopped building homes. The remaining Mackle family members sold the company to out-of-state investors in 1985 and left their roles there a few years later. East of developed Marco Island lie great swaths of mangroves, which in addition to their role in marine ecosystems are also excellent protectors from storm surges. If you can find one, a mangrove creek is still the best place to keep a small boat in a hurricane. Deltona’s “finger-fill” development used dredging to transform swampland into canal-side residential plots. Homestead leaders decided its future lay in encouraging a breakneck sprawl of residential, shopping-mall and commercial development on the potato fields and farms on the east side of U.S. 1 that had long supported the town’s economy. Before long, Homestead was one of the fastest-growing cities in the country. It remains one of the most vulnerable communities in the country to hurricane damage. Meanwhile, as Marco Island recovers from the eyewall, the town must confront its exposure to both storms and rising seas. “Climate change is not always a popular term down in the Marco area,” says Austin Bell, the curator of the Marco Island Historical Society. “But it’s definitely something that needs to be looked at when planning the future of the city.” Freeboard requirements in Marco—how high in relation to the base flood elevation a flood-zone home must be built—are comparatively relaxed. Multimillion-dollar homes, each with a screened-in swimming pool, are perched just above the high tide. And so Marco, the symbol of one generation’s environmental recklessness, finds itself in that role once more.